ALL TAMIL STARS UNITE FOR..
A joint press conference by the Tamil Nadu Producer Council, Nadigar Sangam, Directors Union & FEFSI held today, the 18th of January at Film Chamber regarding releasing the accused members from the Rajiv Gandhi Murder case. 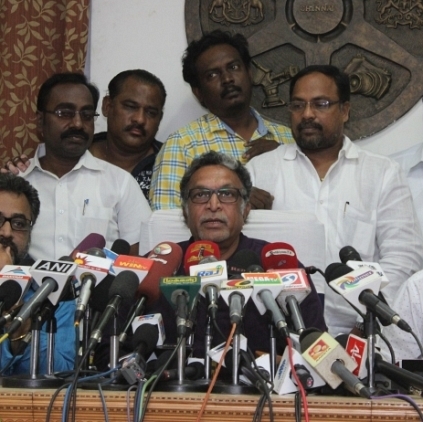 While addressing the media persons, the President of Nadigar Sangam, Nassar said, "We have plans to request CM J Jayalalithaa to release the accused members, Murugan, A.G.Perarivalan, Santhan, Nalini, Robert Payas, Jayakumar and Ravichandran, from the case using section 161. The request will not be in the usual written format, whereas we are planning to unite the entire Tamil film fraternity and conduct a rally to put this forward to our honourable CM. By doing this, it would also create a public awareness". An interesting twist in Thala Ajith’s upcoming? Nadigar Sangam Plans To Give Diwali Goodies To All Its Members. People looking for online information on Nadigar sangam, Nassar, Ponvannan will find this news story useful.